Triumphant Victorious Reminders: October 10 & 11, 2009, "But WAIT"
Everyone of these adjectives in some way describe how circumstances have effected us, are effecting us or will effect us. What do these words represent? For me, the two words that come to mind is GREAT LOSS! When we are victimized we feel violation of innocence stripped with great violence as dignity is lost in the debris of overwhelming sadness. When we are defeated we victory has escaped us. When we have failed our lack of success attempts to strip us of our significant purpose. When the position we have worked in is downsized, our identity along with employment feels as though we are done for. When we are annihilated and overwhelmed the feeling of being destroyed is paralyzing. When we are victimized, and feel defeated and through defeat we feel like failures we are able to do something through Christ. The one thing we don't want to become is a 'volunteer' of the victimization, defeat or failure. We must rise up in our given place through Christ Jesus and that is as conquering victors! We rise up and out of the ashes with God's powerful, mighty hand of deliverance, as He delivers us into His beauty, restoration and significance over who we are. As we begin to know Who He is, we will begin to learn who we truly are in Him! You may ask, "How do I begin to know Who He is?" For me personally, I have to preach to myself. I go to the beginning. I become overwhelmed by the God I serve as great awe overcomes me. "Wow! You are The God of Adam! Adam walked with You and fellowshipped with You! Adam was able to see Your face! You are the God of Abraham, Isaac and Jacob! You are The God of Moses! You are The God of Joshua and Caleb! You are The God of Gideon! You are the God of Haddasau who became Queen Esther! who became the father of Jesse who became the father of David! Woooooo!!! You are The God of Hannah who could not bear children, yet through her womb came one of the greatest prophets, Samuel.! You are The God of David who Samuel anointed with oil as David was chosen by God to become King. From David's generational line came the King of kings and The Lord of lords..JESUS! Almighty God, I get to be called Your daughter; for YOU are my Father through Jesus Christ, revealed by the Holy Spirit!" The more I proclaim these thoughts of AWE, the More it becomes a great equipping over 'self' defeat. I start to see through the eyes of faith and no longer through the eyes of fear. This is more than self affirmation. Even in self affirmation, and it can go a long way, it still has limits, especially in comparison to the limitless God who wants His ability to explode through ours! God's lavishing, immovable, unshakeable, indescribable, incredible, matchless power and love over us being revealed through the Conqueror Himself..Jesus Christ made available to us by the power of the Holy Spirit is when Psalm 91 comes ALIVE! "A thousand may fall by my side and ten thousand at my right hand BUT it shall not come near me." Wooooooooo!!!!! Let us no longer say, "I desire to, BUT..." Let us start doing it and saying, "I feel overwhelmed, BUT GOD..." I must moment by moment be in awe of 'Who He IS and was and will forever be!!!! Let us be strengthened today by the strength provided within us. This strength is not provided because of who we are...but BECAUSE OF OUR GREAT PROVIDER AND WHO HE IS BY HIS HOLY SPIRIT! This is provided when we accept the gift of salvation through JESUS CHRIST, following through with baptism and receiving the Holy Spirit so that we are enabled to disciple others by God's Word to do the same (John 1, Acts 2:1-39). We truly do not know the eternally, awesome impact of salvation provided through Jesus Christ as He did the Will of the Father when we say, "YES" to Him! Salvation was not provided so that we could selfishly received 'Fire Insurance'...Salvation through Jesus was, is and always will be provided to live a victorious life in Him as the redeemed of the Lord say so (Psalm 107:2)...so we must also express it through our hands and feet yielding to the Holy Spirit of God as we see the infinite impact on others around us for His glory and His honor! As the shouts of defeat try to play with our minds....may we shout back with the voice of Triumph who has delivered us...JESUS! We must not relinquish the power over to the enemy who has already lost! He lost at that place called Calvary being defeated as Jesus Christ shed His perfect Blood, and RESURRECTED; conquering death, hell and the grave! I must remind my circumstances that they are conquered...as I do this, I must start living the reminder as I am more than a conqueror through Jesus who loves you and me (Romans 8:37). How easily satan traps us into a corner of these defeatist thoughts and actions. The world jumps on that band wagon and sprays satan's ammunition at us too. Yet, the Power of One, the Strength of the LORD, the Glory and Honor that shines out from Christ into and through the hearts of His children...we are truly able to be victorious when we follow the One. I am blessed tonight as I read your post, inspired by the Holy Spirit. P.S. By the way, thank you for the award this morning. One word---beautiful! You are so inspirational through your writing. I really enjoyed this post, thank you! When I first came across your blog, I thought you were my cousin, you resemble her so much. She is gorgeous and so are you. 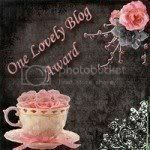 Thank you for commenting on my blog, you are such a sweet person. So true. In times of trial and tribulation, it is a tough challenge to get over "ourself" and seek Him. I've been through this many times, and every time, I'd like to say it gets easier, but it doesn't. He has won the war; He has given us the prize; we don't have to re-fight the war, but we must stand strong amidst the constant battleground that we are left to live in. It's a challenge that I am working at, with Christ at my side and in my heart; but admittingly, I have looked away and have strayed in these times left wondering why. But, because of My Father--He hasn't left me, and He gently guides me back to the truth even when I'm ashamed to do so. Thanks for your inspirational words.